If your students are anything like mine, they are in a bit of a reading slump. It's not that they aren't enjoying reading, it's just practicing for our state test has gotten them .... well ... bored to tears. If it was up to me, test prep would not be on the table. Alas, it's not up to me and I'm following the rules. BUT ... and I mean BUT, I still like to bend things, just a bit. Seriously, who wants to have students sit for 30 minutes a day doing mind numbing multiple choice? What exactly is March Madness? It is certainly NOT a basketball bracket! 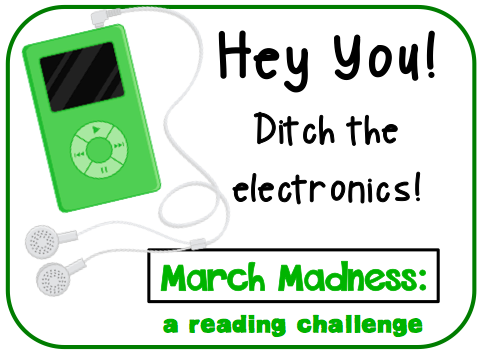 It IS a reading challenge. We have 6 classes of 4th grade on our team. Each class was challenged to READ! And read ... read ... read! Each class has a month to read as many books as possible (If you want a copy of the poster, just click on the picture to download it). Then they take an Accelerated Reader quiz (a program our school pays for). You could also have them writing summaries to show what they've read or have parents sign a log. Either way, whichever class reads the most books in the month is the big winner. I put a display in the hallway so students can track their progress as well as the progress of other classes. Once I approve their book, they write their name and book title on a Shamrock to hang in the hallway. We are losing .. big time! But, that's ok. Today I tried to get them all riled up to read. Will it work? Who knows? We are also doing some ELA testing practice. I found some practice questions from old released items and books I've collected. Students are working in partners to answer questions and find text evidence to support their thinking. We have also been talking a lot about text taking strategies and ways tests "trick" us into picking answers that aren't correct. It's not the most exciting way to do it (and I'm open to anyone's suggestions!). BUT, one way I motivate them is to do some brain break activities at the end of our activity. Have you ever heard of GoNoodle? Check it out! Its FREE and my kids love it. It's basically math practice with a fun twist. We have to practice math questions like the ones that will be on our state assessment in two weeks. So ... I changed it up a little. I could not stand the idea of my kiddos sitting and doing packet after packet of problems. Instead, I split them into "teams". Each team has three students. The teams pick a question card from my pack (they are old released items from previous tests). Questions all have different point values. They range from 1-4 points depending on difficulty and number of steps required to solve the problems. Each person on the team has to solve the problem on their own scratch paper and explain their answer. If each person does this AND gets it right, they earn the points to record on their points sheet. That isn't the madness part of it. The madness is that once they do that, they may each shoot a basket to earn extra points for their team. You'll notice that the recording sheet is numbered. So are the questions. They record their points for a correct answer and any baskets made in the box that correlates to the question they just answered. They are so excited to work together to get the correct answers. I split the groups up so they are all mixed ability. My math students who struggle are getting the benefit of hearing other students explain strategies. My high fliers are getting the benefits of being made to explain and verbalize their processes. And, if that wasn't exciting enough ... I also give them GUM! Here is my box of gum and questions. I do think they are enjoying it AND getting a lot of good review from the activities.